Twickenham proved to be a happy hunting ground for Saints once again as they secured an impressive 30-25 victory against Harlequins in Big Game 7. Scores from the superb Samu Manoa, George North and Kahn Fotuali’i ensured Jim Mallinder’s men will start 2015 on top of the Aviva Premiership pile. Quins had the lion’s share of possession but surrendered an 8-0 lead as Saints’ first return to the scene of May’s title triumph ended with another fine victory. They were made to scrap for the four points as George Lowe’s early try put Quins in the ascendancy and Sam Twomey’s try threatened an unlikely comeback. But sandwiched in between was a Saints performance full of endeavour and tenacity as they made their meagre amount of possession pay in ruthless fashion. It was the mark of champions and inspired memories of the fighting spirit shown in seeing off Saracens on the same turf earlier in the year. Quins, backed by a capacity crowd, had been desperate to give their supporters something to shout about, having won only half of their 10 league matches going into the Twickenham tussle. And Lowe carried the fight from the off as his midfield break pushed Saints back. The centre then popped up on the right to dive over in the corner for the game’s opening try. Swiel missed the tricky touchline conversion but the home side, fired up by the pitchside flames that greeted their arrival, were the dominant force. Their fly-half soon made up for his miss, slotting a penalty from in front of the posts after North was penalised for not rolling away. Stephen Myler issued a quick response at the other end, but Quins were posing plenty of problems, with Ken Pisi doing well to halt a brilliant burst from England man Mike Brown. Saints were desperate to get their forwards in the game and after a clever kick from Ben Foden forced Ugo Monye to hurry his clearance, that was exactly what they did. A penalty was won and from the resulting lineout, the visiting pack turned on the power, with No. 8 Manoa carrying the ball over the line. Myler made the conversion and the game turned into scrap for the next 10 minutes as both sides wrestled to claim the momentum. Salesi Ma’afu fought a little too hard, with the Australian prop seeing yellow for a high tackle on Lowe that drew gasps from the crowd. George Pisi then put in a hit on Matt Hopper that drew attention from the referee, but the TMO deemed the tackle to be legal and Saints pushed on. 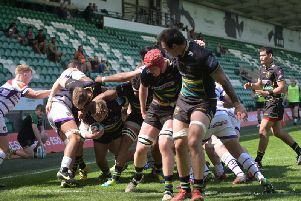 Despite being a man down, Mallinder’s men were eager to play and after some high-tempo stuff from Lee Dickson and Ken Pisi, Quins gave away a penalty in front of their own posts. Myler did the business once again and Saints were more than holding their own with 14 men, as they had done in the stunning victory against Leicester a week earlier. Having been eight points up, Quins found themselves five down at the break and they knew they needed to issue a strong reply from the restart with Ma’afu still in the bin. But Swiel was to endure a horrible start to the half. Firstly, he scuffed a penalty attempt wide of the posts and then saw his clearance charged down by Manoa, who chased the ball down and superbly offloaded for North to score. It was a moment of brilliance from the big American and Myler added the gloss with another well-struck conversion. Saints were almost in for a third score soon after as Danny Care’s poor pass was intercepted by Ken Pisi, whose burst was halted by a superb saving tackle from Swiel on halfway. Having made up for the concession of a try by preventing one, the home fly-half set about atoning for his missed penalty, bisecting the posts to get three points back for his side. Myler was soon restoring the 12-point lead though, easily landing a penalty after a huge shove from the pack at the scrum. To add to Quins’ misery, Saints were able to freshen the front row up by bringing on Alex Corbisiero for his first action since suffering a shoulder ligament injury in September. And Samoan scrum-half Kahn Fotuali’i was also sent on as the away side sought to hammer home their advantage. Instead, Quins came roaring back with wave after wave of pressure finally forcing Saints to crack as Clifford stepped inside North to score. Swiel’s conversion cut the lead to five, but Saints again showed the steel to respond, returning to the other end of the field to try to cement their lead. Quins did well to hold up Corbisiero as he crossed the line and the prop then got over again but lost control of the ball at the crucial moment. It was a huge reprieve for the home side, who had been under the cosh for nearly five minutes as Saints knocked loudly at the door. But finally they made the pressure pay as Fotuali’i picked up from a ruck and darted over the line, with Myler’s conversion taking Saints 12 clear with eight minutes to play. But Quins refused to give up hope, pouring forward in pursuit of a score that would keep their chances of victory alive. And, with three minutes to play, replacement second row forward Twomey surged over the line. Swiel’s kick meant Saints led by just five points and there was an avalanche of noise as the Twickenham faithful sensed an unlikely success. But there was to be no dramatic finale at Twickenham this time round as Foden, playing at scrum-half after an injury to Fotuali’i, booted the ball out to secure the success. Harlequins: Brown; Yarde, Hopper, Lowe, Monye (R Chisholm 66); Swiel, Care; Lambert, Ward (Gray 66), Collier; Matthews, Robson (Twomey 64); Trayfoot, Clifford, Easter (c). Replacements not used: Marfo, Sinckler, J Chisholm, Dickson, Casson. Saints: Foden; K Pisi, G Pisi (Stephenson 48), Burrell, North; Myler, Dickson (Fotuali’i 55 (Wilson 72)); A Waller (Corbisiero 55), Haywood, Ma’afu (Denman 61); Dickinson, Day; Clark (Dowson 61), Wood (c), Manoa. Replacements not used: McMillan, Nutley.